Smart Watches , led primarily by the Apple Watch, are expected to ship 71.5 million units by 2021, up from 31.6 million in 2017. Contributing factors include the adoption of cellular connectivity, additional SKUs from fashion brands, and the transition of kids watches (a phenomenon largely relegated to China) from basic location tracking watches to more sophisticated watches that allow kids to play games, run apps, and communicate with friends/family. 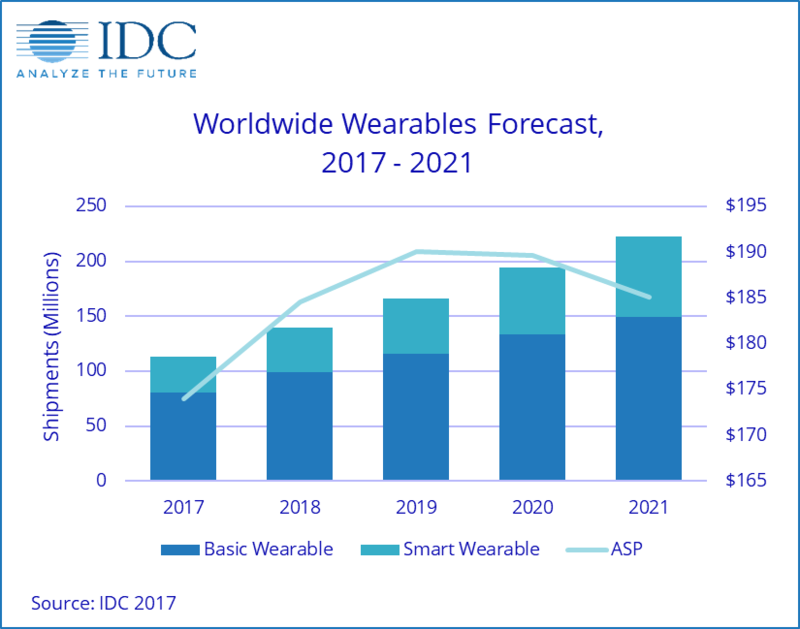 The emerging category of sensor-laden Clothing , led mainly by step-counting shoes, will be a distant fourth as many of the features will be copies of wristbands and watches. Though newer products like the Levi's Commuter Jacket (made in partnership with Google) show promise, their high price points and limited use cases make them a tough sell for the broader market. Note: All figures represent forecast data.